The UK is ideally situated to make the most of wind power and is one of the best areas in Europe for the availability of wind energy. 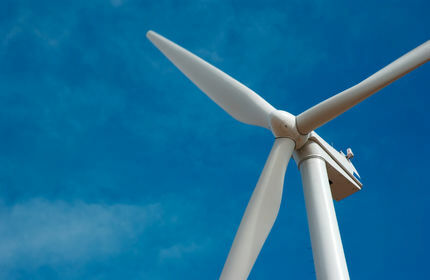 Wind turbines harness the power of the wind and use it to generate electricity in the home. They can provide a source of electricity for certain equipment or appliances or supplement your existing electricity supply. Once installed the system will produce electricity for your own use and any surplus electricity can be exported to the national grid. Your wind turbine can be roof or mast mounted and should be situated in an exposed position where there are no large obstacles in the way, such as trees, buildings or hills. The government is encouraging investment in microgeneration technologies such as wind turbines, allowing users to sign up to sell excess electricity back to the electricity companies. The Feed in Tariff (FiT) is the rate at which all of the electricity generated by your wind turbine is paid. If your system is connected to the national grid, surplus electricity you don’t use can be sold to your utility supplier at a rate of 3.1p/kWh. Based on current figures you should expect to pay for the installation within 10 years.